Looking for a New Kia Stinger in your area? CarGurus has 817 nationwide Kia Stinger dealers with 22,000 new car listings. 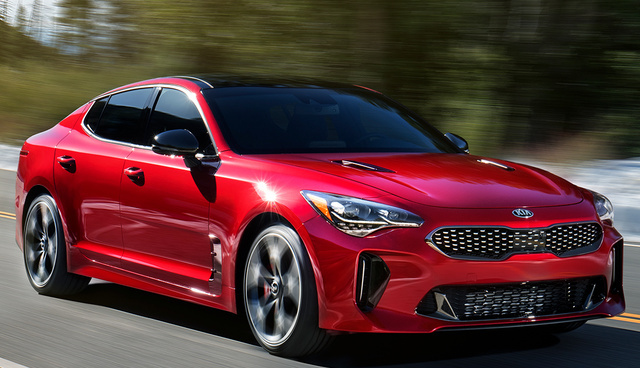 The debuting 2018 Stinger proves Kia can manufacture an upscale performance car. It's at the very core of human nature to sort things. Eons ago, it helped us establish patterns associated with our early ancestors’ predators and prey. Today, this allows our brains to be “metaphor machines,” allowing any new information to fit neatly into pre-conceived boxes. This, of course, makes changing minds against an agreed-upon notion an uphill battle. Most folks sort carmakers into groups that fit into pre-ordained assumptions. In this “continuum of assumption,” Jeep is the brand that builds SUVs, Mercedes-Benz makes luxury cars, and the best trucks are made by the big American automakers. But as anyone who follows the automotive world knows, such assumptions aren’t always fair—or accurate. Jaguar and Bentley—two brands associated with luxury coupes and sedans—now build SUVs. Toyota and Nissan are capable of making fully competent pickups. And, finally, there's Kia. Kia may have a harder uphill battle against stereotype than any other automaker. Anyone I talk to about considering a new Kia always has the same response: “Oh, don’t they make cheap cars?” Sure, that’s how Kia got its start in North America, but for the last 10 years, the Korean automaker has been on a steady ascent in terms of design and quality. 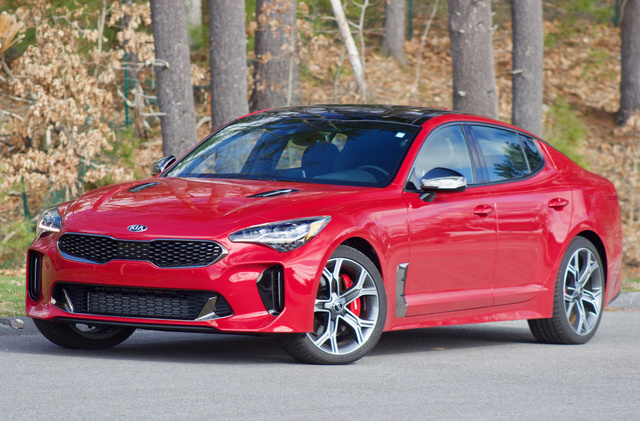 This trend has culminated with the all-new 2019 Kia Stinger—a four-door sports car that has put the automotive world on notice. Frankly, we didn’t know we needed a car like the 2018 Kia Stinger, but it shows that Kia is capable of much more than economical daily drivers. But stereotypes aside, we have to ask: Is the Stinger GT enough to make us take Kia seriously as a performance brand? If we’re to judge books by their proverbial covers, we’d have to say Kia got the job done with the new Stinger. It's low, wide and loaded with vents, and it can’t help making a big entrance. Some of the vents, notably the ones on the hood, are not functional. But we’ll give them a pass, as the car's overall appearance is fantastic. Kia designers wanted to evoke classic European grand touring cars, or GTs. Grand Tourers are large, luxurious sports cars that can handle and accelerate well, but are actually intended for long, spirited road trips. They typically have a 2+2 seating layout (two front/two rear) and plenty of room for luggage. There’s more to it, but consider a classic GT car a large sports car. And when you sit behind the wheel of the Stinger GT, that’s exactly how it feels. The Stinger is comfy and even a bit snug, with the center console and bucket seat all enveloping the driver. This is similar to how a sports car cockpit would feel. The seats feature adjustable bolsters, which are designed to hold you in place around corners, but they can be a bit restrictive for larger drivers. Kia knocked the Stinger's interior design out of the park. It appears to borrow from current luxury sedans, like the flowing dash design and trio of large vents from current Mercedes-Benzes. It also has the dark, mechanical feel that we’d typically associate with Audi or BMW and combines all of these trends for a fantastic cabin design. Modern sports and luxury cars typically have interiors that are nice looking, but not always ergonomically sound. Not so with the Stinger, which has a sensible layout for the cupholders and trays. It also provides great placement for the USB and auxiliary ports. There are five trims for the Stinger: the 2.0L, Premium, GT, GT1, and GT2. Even the base 2.0L trim comes standard with Bluetooth hands-free connectivity, a reversing camera, and impressive leather seating. Other standard features include 18-inch alloy wheels, LED daytime head- and taillights, heated power side mirrors with integrated turn signals, dual exhaust, a 7-inch touchscreen, 12-way power adjustable driver’s seat, heated front seats, heated steering wheel, and dual-zone automatic temperature control. The Premium trim adds a power moonroof, power tilt/telescoping steering wheel, auto-dimming rear-view mirror, and a trip computer with a larger 7-inch TFT (thin-film transistor) screen in the instrument panel. The Premium trim also comes with an electronic parking brake, larger 8-inch touchscreen, and a 15-speaker Harman Kardon premium sound system. Moving up to the GT trim, you get 19-inch alloy wheels, an upgraded grille, additional side accents, a rear diffuser, and those additional vents—whether they're functional or not. The GT trim also adds aluminum center-console accents, door-sill plates, and pedals. The seats also feature a unique “GT” inscription on the headrest and a performance-oriented flat-bottom steering wheel. The GT1 adds many features of the Premium trim, which aren’t all on the GT trim. It also adds an electronically controlled suspension, auto-dimming side mirrors, and additional gauges for G-forces, oil temperature, torque, turbo boost, and a lap timer. The range-topping GT2 trim adds a limited-slip differential, low-beam dynamic headlight assist, power smart trunk, upgraded premium Nappa leather seat trim, a 16-way power adjustable driver’s seat, 12-way power front passenger seat, ventilated front seats, and a host upgraded driver-assistance systems. The GT2 also comes with a shift-by-wire gear selector and is the only trim to offer it. Other trims get a more conventional shifter design, but the shift-by-wire system works without a mechanical linkage to the transmission. The base engine in the Stinger is a 2.0-liter turbocharged 4-cylinder making 255 horsepower and 260 pound-feet of torque. 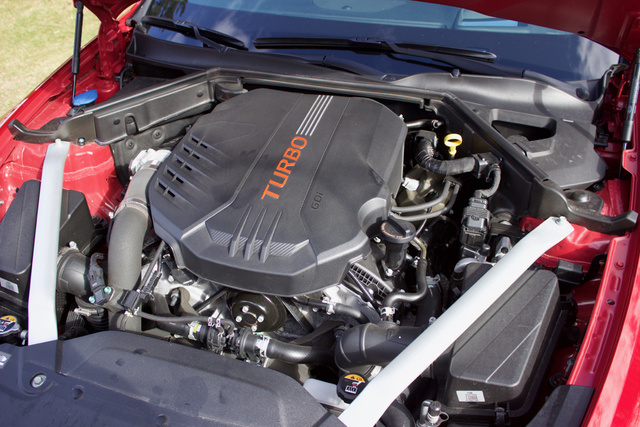 That engine is no slouch, but if you want serious power, go for the GT. Under that hood with the fake vents is a 3.3-liter twin-turbocharged V6. It makes a very impressive 365 horsepower and 376 pound-feet of torque. That’s serious power, no matter what badge is on the hood. No matter which engine is selected, power gets put through an 8-speed automatic transmission to the rear wheels or available all-wheel drive (AWD). The Stinger also features a “passive” suspension, which is tuned to provide a balance of dynamic handling and on-road comfort. The GT, GT1, and GT2 up the ante with an available continuously damping suspension. It's electronically controlled and called Dynamic Stability Damping Control. The already mentioned drive-mode button provides Custom, Eco, Sport, Comfort, and Smart drive modes. Each mode has unique tuning for throttle response, shift mapping, steering response, and suspension damping. Additionally, the system can improve high-speed stability by stiffening the front shocks while softening the rear. If there was any question about the Stinger’s handling prowess, it’s gone now. Our AWD Stinger GT was a blast to drive, remaining incredibly flat through turns. The variable-ratio steering (standard on the GT2) was direct at all speeds and delivered a connected feeling you don’t get with a lot of modern performance cars. And of course, it provided outstanding acceleration. The Stinger has great giddyup in normal driving, but turn the drive-mode dial to Sport, and the car finds another gear in terms of speed and handling dynamics. The acceleration and cornering are both fantastic, and all the while the engine belches out a terrific exhaust note! As we explained, GT cars have to be able to cover long distances quickly and effortlessly. The Stinger is no exception to this, although we experienced some wind noise at speeds of 75 mph and up. 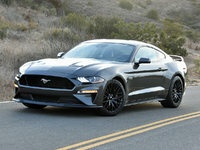 For fuel economy, the AWD, twin-turbo V6 Stinger GT is estimated to get 19 mpg city, 25 highway, 21 combined, which goes for the rear-wheel-drive (RWD) version as well. 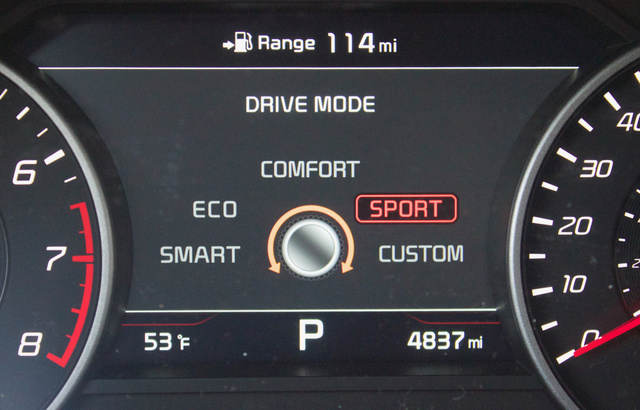 In our week driving the Stinger, we observed fuel economy of 21 mpg. The 4-cylinder turbo with AWD gets 21 city, 29 highway, 24 combined, while the RWD 2-liter does just a bit better, at 22 city, 29 highway, 25 combined. For shorter occupants, seating should be a less challenging issue than it is with my 6-foot-3-inch frame. A shorter driver will have the seat farther forward, which opens up room in the second row. But I had the driver’s seat all the way back, which severely cut down on backseat room. It's manageable, but the high door sills and rear transmission tunnel mean you have to snake your feet into the rear footwells. I would not want to be back there for any longer than a jaunt around the corner. Rather than a conventional trunk lid, the Stinger has a rear hatch. 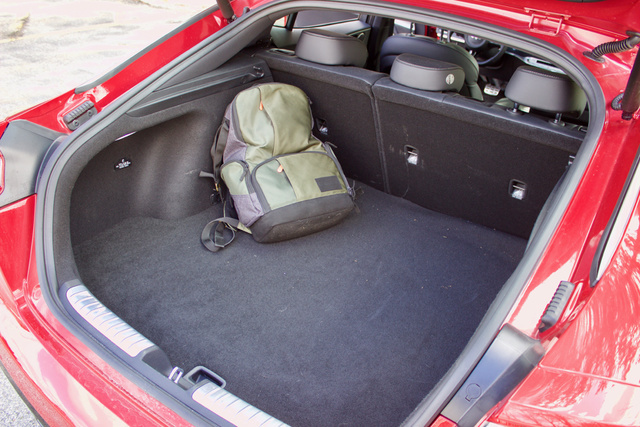 That makes for a large opening and a useful 23 cubic feet of trunk space—which jumps to 40 cubic feet when you drop the rear seats. Compare that to other performance/luxury four-door coupes like the Audi A5 Sportback and BMW 4 Series Gran Coupe, which have 21.8 cubic feet and 17 cubic feet, respectively. This makes the Stinger more functional than you might expect, given its performance focus. As previously stated, the base 2.0L and GT trims get a 7-inch UVO infotainment system. The Premium, GT1, and GT2 trims all get the larger 8-inch UVO system. UVO is a terrifically easy-to-use infotainment system. It has easy-to-read fonts, a high-contrast display, and sensible menu navigation. Consider the two vehicles we just referenced—compared to UVO, BMW’s iDrive and Audi’s MMI are both clunky and bogged down by the need to use a center-console controller, although BMW is improving this with touchscreen capabilities on its newest models. The larger screen comes standard with a navigation system, while all trims come standard with Apple CarPlay and Android Auto. The GT2 trim also comes standard with a head-up display, providing crucial information in the driver’s line of sight, so you won’t need to take your eyes off the road. Standard safety features on the Stinger include a full array of front and side-impact airbags, front and rear crumple zones, child-seat anchoring system, electronic stability control, and a tire pressure monitoring system. All trims also come standard with driver-assistance features such as a reversing camera with dynamic guidelines and front and rear parking sensors. The GT2 comes with standard blind-spot detection, forward-collision warning, lane-departure warning, driver-attention warning, automatic high beams, and adaptive cruise control—all of which are optional for all other trims. The GT2 also comes with a standard lane-keeping assist system, which is optional for the rest of the lineup. It's designed to keep you centered in the lane by sensing the lane lines and using very small steering inputs. But in the Stinger, this system just didn’t feel right. We felt the corrective inputs a little too much while on the highway. In other cars, these inputs are almost too subtle to notice. From a design standpoint, the massive C-pillars and sloping roof make for very poor rearward visibility. 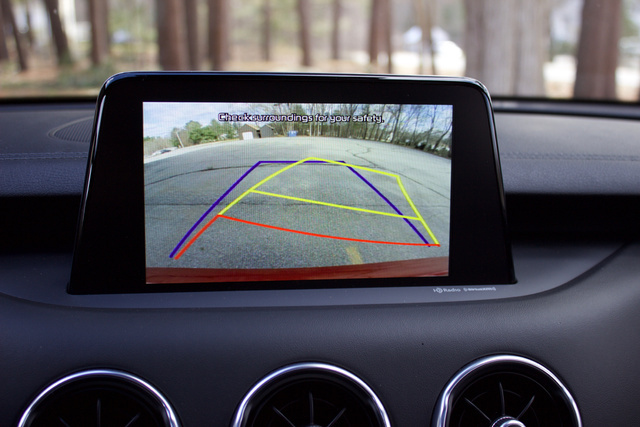 As a result, you almost need the optional driver-assistance systems to ensure you are always aware of hidden hazards. The 2018 Kia Stinger has a base MSRP of $31,900 for the 2.0L with RWD, the 2.0L with AWD starts at $34,100, and the Premium trim starts at $37,100. The GT trim starts at $38,350, the GT1 starts at $43,200, and the GT2 starts $49,200. And our range-topping GT2 AWD test model, factoring in destination, clocked in at $52,300. Cue the “$52,000 for a Kia?! ?” crowd, who are sure to scoff at the notion. But to them I'd ask, "How much are you paying for a badge?" At this price range, Kia expects to be taken seriously among modern upscale performance machines. Consider the aforementioned cars with similar attributes, the Audi A5 Sportback and BMW 4 Series Gran Coupe. A comparably equipped A5 would come in at $44,000, while a 430i Gran Coupe would come in at about $48,000. The German luxury brands love to make your wallet take a hit for creature comforts. And that makes the Stinger a tremendous value. But even without that advantage, based on the way it drives, handles, and looks, the Stinger GT has every right to be taken seriously as a real-deal four-door sports car. 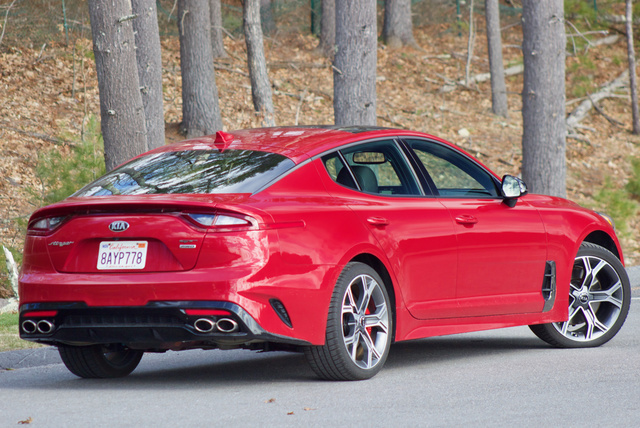 What's your take on the 2018 Kia Stinger? GuruTH7MV It is an awesome looking car. Have you driven a 2018 Kia Stinger? Enter your zip to see incentives for a new Stinger in your area. Looking for a Used Stinger in your area? CarGurus has 3,901 nationwide Stinger listings starting at $22,995. When will Kia come out with the 2018 bras for the Stinger?